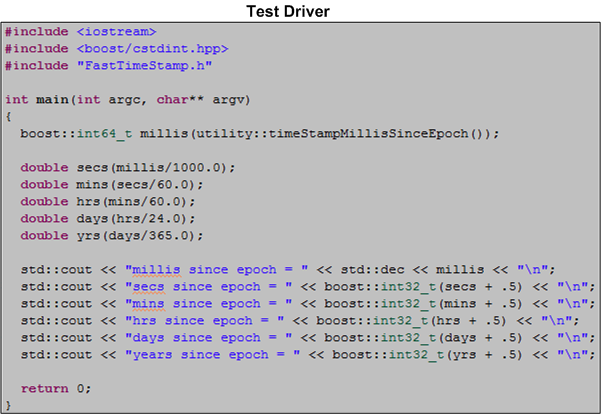 On a recent project, our team needed a fast and portable C++ way to time stamp messages flowing into our system at high rates – down to the millisecond level of resolution. Here’s the boost-based implementation that I concocted. Notice the classic “midnight, January 1, 1970” epoch and the 64 bits required to preclude multiple rollovers in milliseconds since the epoch. What would your fast and portable C++ solution look like? 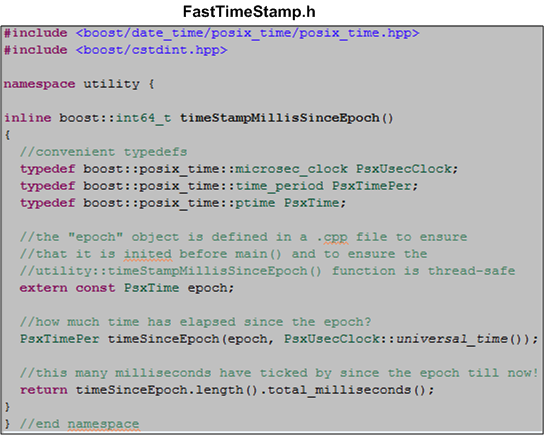 Update 1/5/13: Ever since C++11 arrived on the scene, Boost.Date_Time is longer needed for high resolution timing. As the “Milliseconds Since The Epoch 2” post shows, this functionality is now standard in the <chrono> library.